ConnectSport is working with the Sport for Development Coalition to create a monthly 'call for articles' around a particular theme or subject area. Throughout December 2018 we are publishing articles focusing on 'Sport's role in reducing crime'. Here Professor Rosie Meek, from Royal Holloway University of London, reflects on the use of sport and physical activity in prison settings. To submit an article, contact hello@connectsport.co.uk. Well established as a core element of most prison regimes, sport and physical activity are widely recognised as a valuable way in which to engage with incarcerated populations in promoting health, education, pro-social behaviour and ultimately desistance from crime (Meek et al., 2012; Meek, 2014). It is widely accepted that those leaving prison need to be motivated to change their behaviour and to be equipped with the necessary skills in order to change. It is also clear that those working with people in prison need to be creative in finding ways to respond to the complex needs of those in their care. Although sport is not the only answer, it can provide some solutions to the long-standing problems of the disengagement, disempowerment and disaffection of people in prison. As well as being a way to bring together disparate groups, develop communication skills and learn life lessons, it also has the advantage of being something many people are passionate about. It can be a relatively straightforward way to encourage otherwise reluctant individuals to engage in a whole raft of associated activities - be they education, training or volunteering - while also serving to improve mental and physical health, reduce violence, and ultimately to tackle re-offending. Despite an expectation that those held in custodial care should spend time engaged in sports, fitness and physical activity each week, prisoners consistently report highly inactive lifestyles in custody, and repeated prisons inspectorate reports confirm that many establishments fail to meet policy expectations in this domain. Sedentary behaviour in prisons has been identified as a high-risk health behaviour which contributes to an increased risk of obesity, hypertension, diabetes, cardiovascular disease and mortality (Battaglia et al., 2013), not only placing a considerable cost burden on health care providers both in custody and the community but also acting as a barrier to efforts to rehabilitate. In my recent independent review of sport in youth and adult prisons (Meek, 2018), I identified numerous examples of good practice, many of which were the result of partnerships between prisons and community groups and clubs. I also made a dozen recommendations which the Government have in turn responded to and are largely supportive of. Download the full 100-page report and the Government response here. Given the widespread appeal of sport and the gym, and the strong relationships which prison gym staff often develop with those in their care, it is clear that prison sports have a valuable role to play in many elements of prisoner resettlement, including (but not limited to) promoting education and employment opportunities, as well as the obvious mental and physical health benefits of regular exercise. Specialist and carefully planned methods of delivery can motivate individuals to make positive life changes during their time in prison custody. But there is a need to be creative in promoting engagement from those who are less likely to visit the gym (for example, the unfit, vulnerable, non-sporty or inactive) and to develop strategies for targeting specific populations, such as vulnerable prisoners, those with mental health or substance misuse issues, and those serving short sentences. I’m delighted that the sports and fitness sectors and campaigning bodies have embraced my review findings and I look forward to working with these bodies further in the coming year in extending the positive reach of sport and physical activity into our prisons, with the ultimate goal of rebuilding lives and reducing future victims of crime. Battaglia, C., et al. (2013). Benefits of selected physical exercise programs in detention: a randomized controlled study. International Journal of Environmental Research and Public Health, 10, 11, 5683-5696. Meek, R. Champion, N. & Klier, S. (2012). Fit for Release: How Sports-Based Learning Can Help Prisoners Engage in Education, Gain Employment and Desist from Crime. London: Prisoners Education Trust. 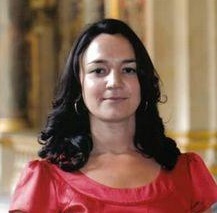 Meek, R. (2014). Sport in Prison: Exploring the Role of Physical Activity in Correctional Settings. Abingdon: Routledge. Meek, R. (2018). 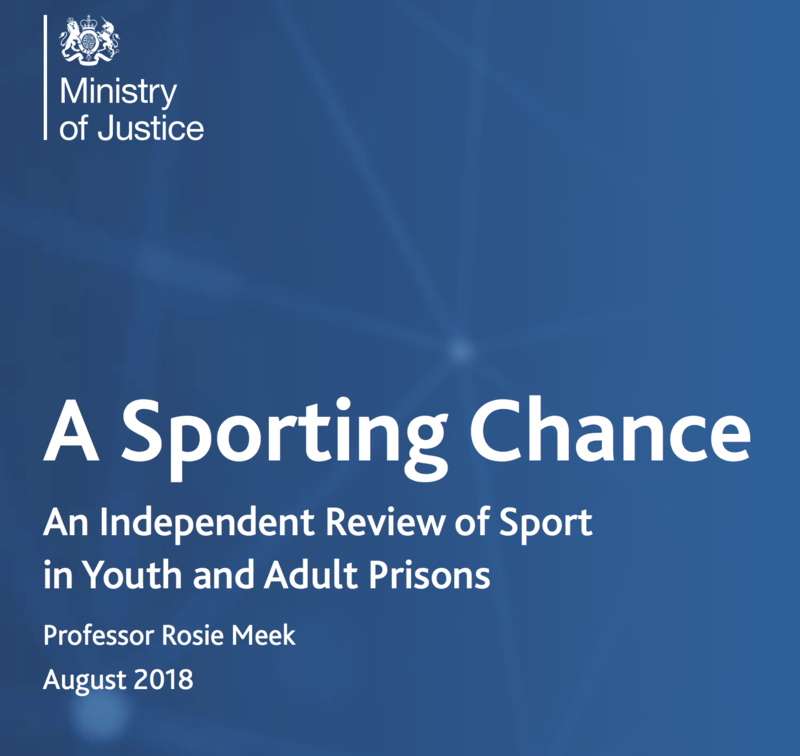 A Sporting Chance: An Independent Review of Sport in Youth and Adult Prisons. London: MoJ. Pic credit: Ex-offender Pete Bell delivering his football-based mentoring programmes in custody.